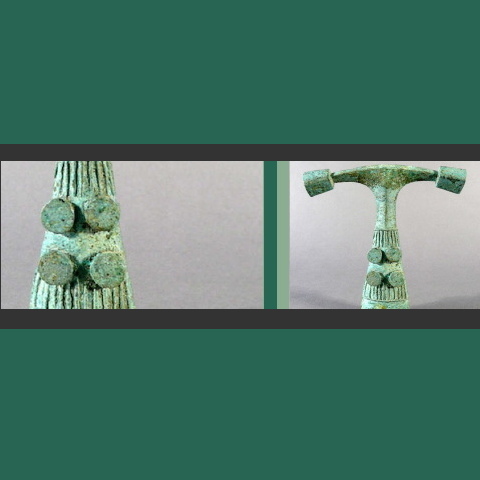 Tribal art dealer, Mark Johnson has just added an unusual bronze grip to his website. He indicates it was excavated in Java and is approximately 2,000 years old, dating from the Indonesian bronze age, often referred to at the Dong Son period. I have never seen a similar piece from Indonesia, or anywhere else for that matter, yet find its form rather striking in its simplicity. It reminds me of something, but of nothing ancient I have ever seen from Southeast Asia. The protruding “buttons” seem vaguely (but not entirely) reminiscent of the appended balls on ancient bronze bracelets from Alor and Pantar Islands. Or perhaps reminiscent of certain types of African bronzes? I have sent a link to my good friend Ambra Calo, who is an archaeologist specialising in Southeast Asian bronze age artefacts. If her response is interesting, of course I’ll post it here.